https://www.google.com/maps/d/edit?mid=1bIuP5Y0lRT_Ae_9c4CfZCyZvuwY <–Planned route to Indianapolis, after many revisions, in an attempt to avoid tornadoes and hail in the south and Midwest. Thursday, May 19, 2016 – Leaving Provo we took 189 through Provo Canyon. Good, winding road through mountains and along lakes and rivers. So much better than going up through busy Salt Lake City to get to Interstate 80! Saw part of the Rocky Mtn. range as we drove through Wyoming. Landed at Western Hills RV Park in Rawlins, WY. A nice enough park, up on a bit of a rise. $31/night for full hookup (with AAA discount). We were gonna stay here 2 nights, but the wind was really strong and that stresses Poppins out, so heading out to North Platte, NE in the morning. Friday, May 20, 2016 – After listening to trains blow their horns all night, we headed out for North Platte, NE. Lots of farmland. Cows, sheep, antelope, wild turkey (not in the bottle), even llamas. Stayed overnight at the Holiday RV Park. $31 with AAA discount for a full hookup. Lovely little park near the South Platte river. The North Platte river is currently at flood stage. 🙂 Yay! We hope to stay for 2 days and see some of North Platte, weather forecast looks ok for the rest of our route, and we’re both dingy from driving for 4 days. Staying at Elks Lodge #39 in Omaha. Small parking lot, but they kindly let us park here. Didn’t even ask for a donation, of course we gave one anyway. 🙂 We feel a lot better, by tomorrow we should be completely out of tornado alley and the worst of the threat. Sunday, May 22, 2016 – Crossed the Missouri River into Iowa early this morning. Lots of corn fields along the route and way too many roadkill deer and other critters along the highway. 😦 Spent the night at Shady Creek Campground right on the mighty Mississippi river. What a gem! 50amp electric at all sites, water, and a dump station on site for $10 a night (with our annual National Park pass). Watched boats pushing barges along the river, swatted gnats away, and felt the humidity rise! These Corps of Engineering parks have a 14 day limit – we plan to remember this one and return off season before the temperatures and humidity kick in. We loved this spot! Monday, May 23 -> Friday, May 27, 2016 – Sangchris State Park, Site #31 on Sangchris Lake. Just southeast of Springfield, Ill. Beautiful, huge lake, lots of fishing going on. Our site was difficult to level, but worthwhile once we did. The heat and humidity is really kicking up here. On Wed 5/25, we visited the Abe Lincoln Presidential Library & Museum in Springfield. A really worthwhile museum. They had so many lifelike displays of the people, rooms, and buildings back then. One of the docents we spoke to said they had artists from Disney help them out with it. Some of them were just chilling. It was also interesting to see so many of the scathing newspaper/magazine articles from the election, and then from his Emancipation Proclamation. Brutal. Things haven’t changed at all apparently. Friday, May 27, 2016 – Left Sangchris Lake for Indianapolis. Arrived at Lake Haven Retreat for the week. Started looking into shuttle and parking options for the Indy 500 on Sunday. We called last month and were told parking at the speedway was sold out. Didn’t know we could or needed to reserve parking at the venue! So we found 4 locations that were running a parking space and shuttle service. Ok, another $70 to park, but whatever. We figured the airport was our closest option, so I checked that out and found online that they were completely sold out as well. Thankfully, the second closest location had openings so we snagged it. Arrived at the parking area around 7:45am and the place is almost full already! We waited in line for the shuttle for an hour. When we boarded the bus and looked back at the lot and the line, we found the line had more than doubled and people were parking along the street, in lawns, etc. Figured many of them didn’t make the start of the race. What a zoo. Apparently, this was the first time in history the race has sold out. There were more than 330,000 people there. Just crazy. Getting to our seat was painful, but once we found it, we were in the shade!! Right above pit row. Phew! Monday, May 30 -> Friday, June 3, 2016 – So, our toilet broke 7 days after we’d had the whole motor thingy replaced. Why they figured some electrical flushing thing was good for an RV is a mystery. After 6 years of nothing but trouble, we were able to swap it out with an old fashioned, simple flushing RV toilet. Yay. Spent an afternoon at the historic Crown Hill National Cemetery in Indy. Such a huge, beautiful, old, stunning cemetery. It’s at the highest point of the city, with a great view of downtown from the tomb of poet, James Whitcomb Riley, John Dillinger and President Benjamin Harrison. The statuary and mausoleum doors, works of art in themselves, are worth a visit when in the area! …and the house… of course these pictures don’t do it justice. The son and daughter of Herbert Johnson, who had Wingspread built, did a little video for visitors telling what it was like moving into the place. 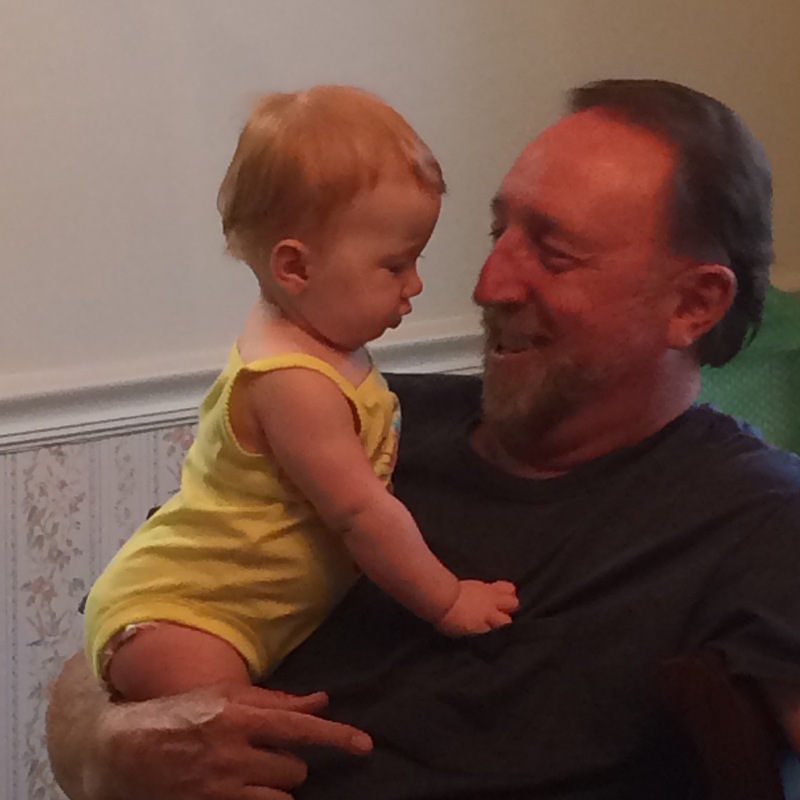 The son told some hysterical stories. One of this vertical fireplace that Frank thought would be stunning with tall birch logs lit. He said they lit them once and, of course, the bottoms burned first then the unburned tops started dropping down and falling out of the fireplace, they were hauling smoking/burning birch logs out the front door. He said he doesn’t think they ever used that fireplace again! Then we lucked into a once a year tour of the old WindPoint, WI Lighthouse (that one was not free). Great history and views of Lake Michigan. Wednesday, June 8, 2016 – Reluctantly left the Racine/Windpoint, WI area heading West. Landed at another Corps of Engineers campground called Highland Ridge in Spring Valley, WI. Greg drove in to St. Paul, MN to get the Honda set up with a new set of tires. Tuesday, June 21, 2016 – left Elks Point/Wall Lake in Dane Prairie Township near Fergus Falls, MN around 8:30am. Stopped in West Fargo, ND for a Costco fix. Arrived at the Hazelton Rec Area along the Missouri River, about 30 mile SE of Bismark, ND – site #8 around 2:30pm. Beautiful COE park, electric only tho’. Only one other camper in the whole park, but later that afternoon, two guys came in to tent camp on their bike ride journey from Iowa to Montana. Huge storm with crazy lightening & wind all night. One of the biking guys’ tents was blown over with him in it. They came to our door around 1am, and they spent the rest of the night in our Honda. We lost electricity, and heard (the next morning) that the winds hit gusts of 85 mph that night. It looked like an old time disco the way the lightening flashed all night, and the wind just had the trees around us blowing straight up, no direction otherwise. I broke my little toe in the wee hours of the morning going back and forth in the dark trying to calm Poppins. Arrived at the Heartland RV Campground in Hermosa, SD, about 20 minutes south of Rapid City, SD. Nice park, a little too close to your neighbor, but clean, with full 50amp hookups, a pool and laundry. Three nights here with Passport America rates, then we moved about a mile north on Hwy 79, still in Hermosa, called Southern Hills RV Park. Also to use the Passport America rates. Lots fewer amenities here, and a much poorer maintained park. Tuesday, July 5, 2016 – On to Devil’s Tower, WY today. Great little walk around the base of the tower – my first real walk since breaking my toe 2 weeks ago today. Had a great breakfast on Wed, the 6th at the Devils Tower View Campground restaurant that morning. The owner is a sweetheart, and food was yummy! We pushed on to Garryowen, MT today and checked in to 7th Ranch Campground. A gorgeous campground. Terraced, with views from most every site. We figured this place as a stop over on our way to Bozeman to visit the Spear family, and the Spethmans, who were flying in to visit. What a great national monument there in Garryowen. We’d heard in grade-school history of the battle of Little Bighorn, but this was the location of the fiasco itself. Such hubris! Amazing place, so sobering, so sad. Markers where they found the bodies of most of the men who died. Much bigger than we ever expected. We thought we’d kill an hour or so there, and ended up spending 3.5 hours and still didn’t get to take one of the walks we wanted to ’cause we had to get back to the pup. 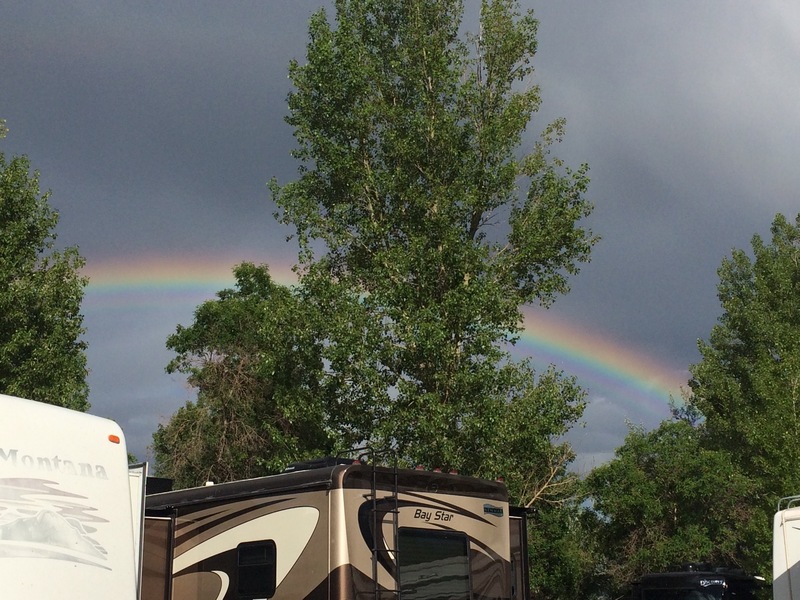 On Friday, July 8th, we arrived at the Sunrise Campground in Bozeman, MT. Nice little place, near the train tracks and the highway, but the sound was not bad at all! Very sweet owners, and very close to the Spear family we were there to visit for Mike Spethman’s birthday. Bozeman, MT is a great town! Had pizza at the Spears’ home in their new casa. The next day, joined them at Chico Hot Springs watching the little Spears having a wonderful time in the pool. Then some pretty decent Mexican food at Fiesta En Jalisco in Livingston. On the 10th we joined the Spethman’s & Spears for Mikes Bday dinner at Sir Scott’s Oasis in Manhatten, MT. We want to come back to Bozeman! Wednesday July 13, 2016 – we finally made it to Apgar campground inside Glacier Nat’l Park (west side). Wanted to visit here on our trip 2 years ago to/from Alaska, but ran out of time. It’s all first come first serve, no reservations, so we were lucky to grab a nice large site at the far end of Loop A. No cell coverage here. Stalked the rest of the place and were able to move to Loop C # 156 (tight) to get cell coverage after 2 nights. It’s a beautiful national park. Going to the Sun Road was terrifying (for me) with amazing scenery. The Many Glacier & St. Mary areas were stunning. The visitor center at Logan Pass, and all the hiking trails, especially Avalanche and McDonald River trails. Monday, July 25, 2016 – And here we are in Cardston, Alberta, CA. Back again at Lee Creek Campground, the same place we stayed in 2014. This time we were able to visit Waterton Lakes Nat’l Park for a couple of days longer as well. It’s the Canadian side of U.S. Glacier Nat’l Park. Friday, July 29, 2016 – We traveled the Cowboy Trail up to George Lane Memorial Park campground in the beautiful town of High River, AB. The town is aptly named. They are still rebuilding/recovering after the last river flood in 2013. It is a beautiful place though! Took lots of walks around the town and countryside. Monday, August 1, 2016 – Left George Lane Park in High River, AB on the way to Banff Nat’l Park, Tunnel Mt I campground, site H13, very tight & no hookups. I need to join the Elks! At least the rain is in the distance and the snow in the mountains. We really liked Provo when we assed thru and have it as a place to return to some day. This sounds like a great adventure, looking forward to following along! Beautiful scenery, I’m so envious! 189 is indeed a beautiful drive, so much of UT is just amazing. Your pics are a great, nice to see the contrast of the snow with the green of the valley. It was HOT when we went thru, everything a nice even gold. Nice find on the COE campsite! Gnats and all, it looks perfect. We picked up the Camping with the COE book but have yet to camp at one. Safe Travels! Are you still in Racine? Why you ask? BEER! It’s in the top half of the top 20 beer cities. Well all of the top 5 and 12 of the top 20 are in WI. Your pics of it a beautiful, but drive with a bit of extra caution and enjoy the BEER! 🙂 Well, it is close to Milwaukee! I wanted to look for the Schotz Brewery from Laverne & Shirley, but Greg wouldn’t go for it. We have friends just south of Bozeman. That’s such a ‘gateway’ area with lots of fun outdoor activities. Looking forward to your pics!